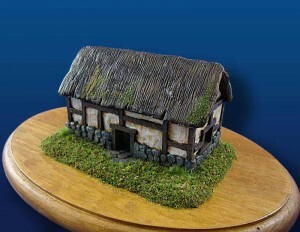 Acheson Creations gives us a look at their new Half Timbered House terrain piece. Acheson Creations announces the arrival of the next in their line of Medieval products, the Half-Timbered House, priced at $15.00USD (unpainted only at this time). Sculpted by Craig Acheson, this figure is 7cm (2 7/8 inches) tall, 11cm (4 1/4 inches) long, and 5.4cm (2 7/8 inches) deep, and is modeled in 20mm (1:72 scale). Please consider joining the 14/7 membership discount club which offers a 20% discount on all unpainted products ordered from the AchesonCreations.com website and from the Acheson booth at upcoming shows and conventions. Membership is $30 per year.